Home Perfect Square Hyperslicer Give Away – Reminder! Perfect Square Hyperslicer Give Away – Reminder! The amount of responses for the Perfect Square Hyperslicer Give Away has been pretty awesome. I mentioned earlier that I like it when pedals are a little unusual,interesting and unique. This pedal definitely fits that mold. We’re currently at the half way point for this give away, so be sure to get your entry in before it’s too late. I only have one to give away! So what is the Perfect Square Electronics Hyperslicer all about? It’s basically a tremolo that takes digital slices out of your signal. You can set it to slice a particular number (2,4,8 or infinite), you can set the percentage of silence and control the tempo. 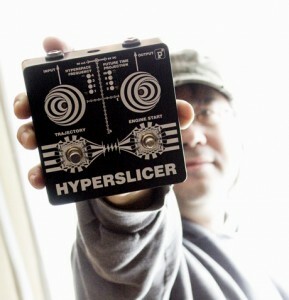 For the full demo, check out the following post: Perfect Square Electronics – Hyperslicer Demo. I’ll include the demo video below though, but be sure to check out the post above for the high quality MP3 clip or to read up on all the features/functionality of the pedal. I would also like to thank Ben Anderson of Perfect Square Electronics for sponsoring this give away. Please take a moment to check out their web site! For details on entering the give away, please read this post: Perfect Square Hyperslicer Give Away! Complete instructions and entry form is available on that post. One week left to go! Good luck everyone! Perfect Square Hyperslicer Give Away! Perfect Square Electronics – Hyperslicer Demo Marshall VT-1 Vibratrem Winner Jack DeVille Electronics Dark Echo Give Away!